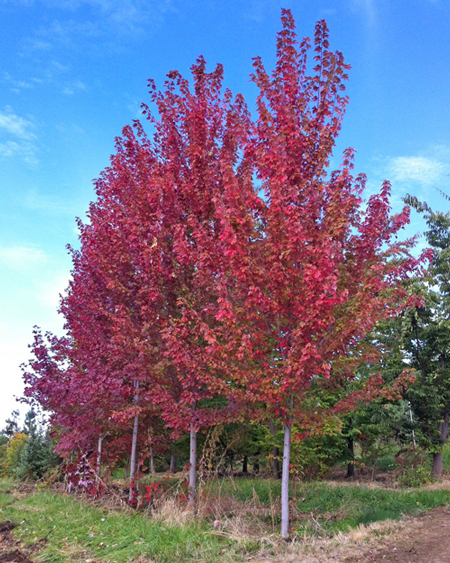 Autumn Blaze Maple is a seedless hybrid of red and silver maples, so it won't be producing seedlings all over the place. The cross gives it the sturdiness of a silver maple along with the beauty (especially the excellent fall colors) of the red maple. This large oval-crowned tree is a choice large street or yard tree, tolerating most soil types plus wet or drought conditions. Expecially swift-growing, this maple cross may add 3ft or more per year until it reaches 50ft tall and about 40ft wide, with medium-green foliage and in autumn, long-lasting vivid orange-red leaves. In winter, the new growth on the trees is reddish, giving the bare tree a brighter-than-average winter aspect.